Favourites to reach the final of the Mixed Team event at the Buenos Aires 2018 Youth Olympic Games, following the draw conducted on the evening of Saturday 13th October; that scenario is possible. China’s Wang Chuqin and Sun Yingsha, the no.4 seeds appear in the opposite half of the draw to Japan’s Tomokazu Harimoto and Miu Hirano, the top seeds. However, first things first, they must negotiate three rounds before such a scenario is possible and in the biggest events of all, as the pressure mounts and glory beckons, strange things can happen. Tomokazu Harimoto and Miu Hirano start their quest against the combination of Ioannis Sgouroplous of Greece and Nadezhda Bogdanova of Belarus, the no.14 seeds; in the same half of the draw Sweden’s Truls Moregard and Sabina Surjan, the no.3 seeds, oppose Italy’s Matteo Mutti and Jamila Laurenti, the no.16 seeds. Matteo Mutti has been most impressive, in the group stage of the Mixed Team event, he came mightily close to overcoming Wu Chuqin, whilst the only player to beat Jamila Laurenti, as the Italians progressed to the main draw, was Sun Yingsha. Do the girls hold the key; such a scenario could well be the situation in the remaining contests in the top half of the draw. Kanak Jha and Amy Wang of the United States, the no.5 seeds, confront Azerbaijan’s Yu Khinhang and Ning Jing, the no.22 seeds; both Amy Wang and Ning Jing reached the quarter-finals of the Women’s Singles event and remained unbeaten in their first stage Mixed Team singles matches. It is to some extent a similar scenario for Chile’s Nicolas Burgos and Puerto Rico’s Adriana Diaz, the no.7 seeds; they face the in-form combination of Moldova’s Vladislav Ursu and Slovenia’s Aleksandra Vovk, the no.24 seeds. In the opening contest Adriana Diaz opposes Aleksandra Vovk, the outcome of that engagement could well provide the impetus needed. Meanwhile, in the opposite half of the draw, Wang Chuqin and Sun Yingsha face Brazil’s Guilherme Teodoro and Bruna Takahashi, the no.11 seeds, a fixture in which they start the favourites. However, for the Chinese Taipei’s Lin Yun-Ju and Su Pei-Ling, the no.2 seeds, they oppose a pairing who could well pose problems. They confront DPR Korea’s Kim Song Gun and Pyon Song Gyong, the no.32 seeds. One has to back Lin Yun-Ju but Su Pei-Ling has not enjoyed the best of fortunes, Pyon Song Gyong has been quite a revelation. 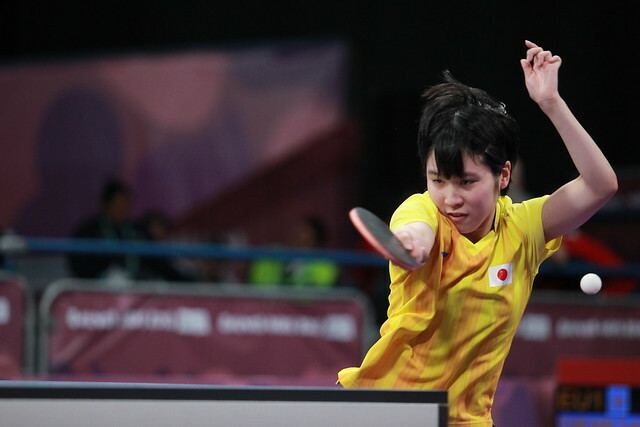 Pyon Song Gyong in form; likewise Mariia Tailakova has impressed, she could well prove the pivotal player in partnership with Vladimir Sidorenko as Russia, the no.21 seeds oppose Korea Republic’s Cho Daeseong and Choi Haeeun, the no.30 seeds. Similarly Romania will be looking towards Andreea Dragoman to repeat her bronze medal Women’s Singles success against Archana Girish Kamath, as occupying the no.9 seeded position, they face India, the no.6 seeds. Current form suggests Cristian Pletea may just start the slight favourite again Manav Vikash Thakkar but a new day, a new dawn, who knows? Both the first round and the quarter-final will be played on Sunday 14th October, the penultimate day of action in Buenos Aires.